My son likes the outdoors too. 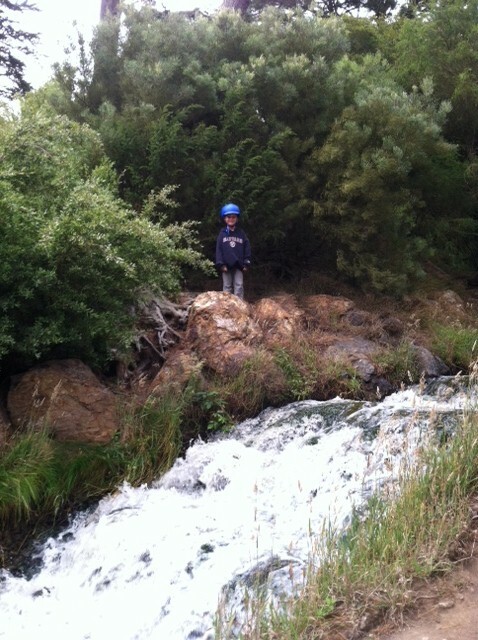 And he likes climbing up the hidden waterfalls of Golden Gate Park. With his helmet. Safety first! But there has been an unexpected downside to our commute. His helmet is one of those aero-style Giros that bumps out in the back, and has a sharp edge where the plastic decoration stops and the uncovered foam begins. When we rode together his helmet was cutting open my chin. My chin was bleeding because of my son’s helmet. It was the world’s most implausible bike injury. We’re taking a trip soon and mailing our helmets in advance. Having a spare helmet was starting to sound like a good idea. Shopping for a helmet with a smooth back, which was my personal goal for his new helmet, was much harder. For some reason the aero-style with the back bump is all the rage in kids’ helmets locally. I had to go online, and that raised issues with fit. My son has a giant head. I picked stores with generous return policies (Amazon and Real Cyclist) and ended up using them as we worked our way up through the sizes that were supposed to fit him based on head circumference and did not. Eventually we found a Bern helmet that fit him in blue (he really wanted a blue helmet). It was an adult size small. I love this helmet. It has never cut my chin. It’s as smooth as glass. I kissed it while we were riding on Friday, I was so grateful not to be gouged. I liked it so much I got one just like it for my spare helmet. Matchy matchy. My son likes both his helmets. Specifically he likes having two helmets. Sometimes he wears them both in one day (not at the same time). As long as he wears the Bern while he’s riding the Brompton, that’s just fine. My son uses a Bern and I LOVE it–the smooth round shape, the neon yellow color, and the interchangeable summer & winter liners. For what it’s worth, I always recommend snowboard-inspired helmets like Bern and Nutcase for parents whose kids are going to be riding in bike seats (either front or rear) or trailers. Not having that useless “aero”-style point jutting out in back makes life more pleasant for everyone.